The Trust’s library collection contains several thousand books, journals, pamphlets, ephemera and university dissertations which come from a wide variety of sources. Technical books were collected by the Technical Library and Intelligence Department of C & J Clark Ltd in order to support the manufacturing and design aspects of the business and to collate data on the shoemaking and leather industries. Books on fashion and costume history were acquired through the diverse interests of the company’s Shoe Museum, and collections in Quakerism and local history have often come from members of the wider Clark family. The Trust also holds the rare book collection of Street Meeting House (Society of Friends). The book collection covers a wide variety of topics including business history, shoe manufacturing, fashion and costume history, Quakerism, geneaology and local history, as well as Clarks in-house publications. The collection includes a wide range of publications in this area, such as richly illustrated oversize volumes with coloured fashion plates, technical shoemaking journals and handbooks, and general books on costume and fashion history. These publications constitute one of the treasure troves of the Trust’s wider collections. Shoe catalogues and price lists produced since 1848 show what was being made and sold over time by C & J Clark, making it possible to identify specific shoes and to date them precisely, as well as to trace the history of popular ranges and advertising campaigns. The Clarks shoe catalogue collection contains about 1,500 catalogues. The Trust’s collection continues to grow and is added to annually, showcasing the company’s current ranges for men, women, children as well as the Sport and Original ranges. The Trust also holds shoe catalogues for other major UK shoe manufacturers, although these are not as complete as for Clarks. Clarks has produced in-house publications since 1924, when the News Sheet was brought in to communicate the activities of the Factory Council. This widened its remit as the company expanded its manufacturing activities outside of Street after World War Two. The News Sheet finished in 1956 when it was replaced by the company’s very own newspaper, The Courier (1957-1992) and its successor Clarks International (1993-1996). This communicated news relevant to employees across the UK and beyond, such as factory openings, successful advertising campaigns and management restructurings as well as social items such as factory sporting events, beauty competitions, employee weddings and competitions. Clarks Comments was published from 1939-1973 and was targeted instead at a retail audience i.e. independent and Clarks shoe shops selling Clarks shoes. This concentrated on giving information on style shoes and exhibitions, advertising campaigns, window-dressing competitions, interviews with key members of the family and firm and sometimes articles of interest about Street’s local history. These two library collections come from Millfield, home of William Stephens Clark, and Whitenights, home of William’s son Roger Clark. The family’s strong interests in Quaker history, local and American history, biography and family history (including the life of William’s father-in-law John Bright MP) are strongly evident, as well as education and shoemaking. The collections contain books, serials, pamphlets and ephemera, the earliest items dating from the 1660s, just at Quakerism was starting to take a hold in the Westcountry and in Street itself. Many items have inscriptions from one or several subsequent members of the Clark family. Most of the collection is in English, although some items are in German, French and Italian. Some interesting non-print items are included in these book collections, such as the bound typescript diaries of John Bright MP, the minute books of the Street and District Nursing Association (1900-1953), the Street Child Welfare Association (1908-1958) and the Somerset Moral Welfare Association (Street branch, 1835-1887). Papers of two 19th century literary societies, the Avaloniana and the Street Budget, pre-date those of the Village Album, which is still active in Street today. Collection overviews of the Millfield and Whitenights book collections give further details for those interested in finding out more. The Meeting House transferred their rare book collection to the Trust in 2013 and it is currently being catalogued. The collection was accumulated through the Monthly Meeting of the Middle Division of Somerset, specifically with reference to British and American Quakers. 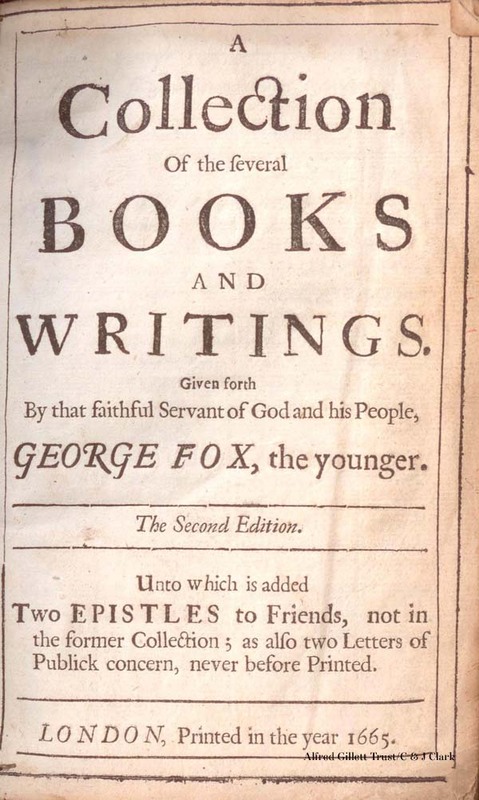 This collection contains primarily religious texts and printed journals of eminent Quaker figures such as George Fox, alongside publications of the Society of Friends. The collection is mainly 18-19th century but does include some 17th century items such as Stephen Crisp’s Account of Travels (1696) and William Penn’s Harmony of Divine and Heavenly Doctrines (1696). The oldest item in the Meeting House collection dates from 1665.